Tube wells using water from deep aquifers for irrigation. How can the water be used most efficiently? Are the aquifers being depleted? The water figures above come from the Food and Agricultural Organization of the United Nations Committee on World Food Security – High Level Panel of Experts on Food Security and Nutrition who were commissioned to prepare a report on Water and Food Security. [Guess the organizations who like acronymys: FAO UN WFS (and WFS with a different W) HLPE FSN all appear on the web!] The draft report makes some science-based contribution to the facts and defining needs for water usage and its availability with respect to food security, but in many areas is off-topic and does not cover the ground in relation to the request of the UN Committee on Food Security. People have been invited to comment on the report, and here I am giving my comments and response. I have significant reservations about the impact of the report in the present format. At a little over 100 pages, it is far from concise, and is poorly structured, so data, recommendations and the key messages are lost. Unfortunately, I think the draft report also misses key aspects where robust scientific advice is needed to inform political, policy and treaty decisions or recommendations. Although indicated in the Terms of Reference, the target audience and route to implementation of recommendations should be made explicit and the report needs focus. I think that many areas of the third chapter, ‘Governing water for FSN’, stray into political issues, when the purpose of this report (and the Terms of Reference) is to provide scientific underpinning for robust policy advice. In particular, I think there are three critical recommendations required in terms of Water and Food Security. First, a robust, global measurement framework to collect data a world-wide map with high spatial and temporal (seasonal) resolution is required for water availability, usage and quality, throughout the world. This will inform policy decisions and give a base-line for interventions. Second, a major genetic research effort is required to understand the genetic variation available within current and candidate agricultural plants, and to an extent animals (including fish and insects), as related to the efficiency of water usage; and to study how this variation can be exploited in current and prospective socioeconomic and farming conditions. Thirdly, education is critical to future agricultural sustainability, ecological management, capacity building and equality. This recommendation should cut across other issues, and is important at all levels from primary school through to post-graduate and farmers. While I am critical of the excessive length of the report, with discourses on management of somewhat peripheral water-related issues, I believe it does not give enough emphasis to the significant successful (or unsuccessful, and including reactive interventions to water problems) examples where science-based policy changes and management, implemented by farmers and regional governments, have occurred with respect to water and food security (including sustainable usage) usage in many countries over the last century. – The significant Australian successes are not well covered – they go far beyond the water reform legislation in 2007- 2008; water management has become central in every family farm in that country (many of thousands of hectares) in the last two decades. – Going further back, the remediation of arguably the greatest human-caused environmental catastrophe, in the 1930s, of the dust-bowls of the Western US, was an example of successful agricultural and water management reacting to a major problem. – Within this century, two significant new policies are already having major effects on agricultural water usage as well as current and future, The Kingdom of Saudi Arabia has implemented major structural and regulatory changes, away from the plan for high production of cereals (self-sufficiency, as initiated in the 1980s) because it became clear in the 2000s that it is too resource-intensive in terms of water: trade with countries with more water is more efficient and sustainable for cereals. 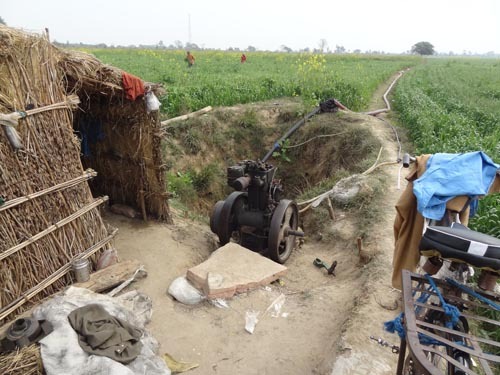 In the Indian Punjab, region-wide changes in agriculture now mean double cropping of much land, but depletion of aquifers was becoming a major possibility; restrictions on irrigation dates are now implemented. It is good that the report considers the entirety of the position of water in food security and socioeconomic context. However, it is grossly imbalanced: the term ‘sanitation’ is mentioned no less than 133 times, more than twice ‘drink’… or ‘indust’…, or four times ‘salin’…! This is but one example where peripheral issues have high prominence, and I think that major rebalancing is required to focus on key issues. As another example where key issues are buried, the global population change is mentioned multiple times (2050 and two billion more people and increase in meat and oil consumption), the global figure means little compared to the impact in individual countries. For example, on page 16, the graph should show population growth for Ethiopia as well as other lines: the progress from famine of 1984 to a reasonably fed population now, with growth from 40 million to 96 million in the same period, is remarkable. I believe it is important that all countries have a rigorous measurement framework for the status of water with a national, high resolution grid, and finer resolution in the vicinity of open water or aquifers (coasts, lakes or major rivers). The appropriate grid scale and parameters must be defined in conjunction with timescales and resource implications, but my suggestion would be 10km over most areas and 1km in water-impacted regions. There should, though, be robust, evidence-based reasons regarding grid size and where a larger grid is appropriate, as it will be in landscapes with even geology, vegetation and unchanging features. The measurements should include water input, flows/extraction, evapotranspiration, groundwater, water tables, salinity, and BOD among other routine parameters. Page 9 notes “In water, data is very often a challenge for action. Data definition, quality and transparency, precision at lower geographical scales, disaggregation by users, and gaps are the biggest issues.” but there is little mention later of the need for international data. Section 8 also has some relevant material. How will this be implemented? The single mention of “remote sensing” on p79 is extremely weak: it is a key technology for assessment and monitoring of water amounts, distribution, quality and flow; policy definition, development and research on new water usage approaches, even for plant breeding selection approaches. Is it satellite, aircraft, ROV, in situ transponders/sondes? The one mention of remote sensing in the draft report is even in the context of “citizen science” – I would suggest data collection on water is a major duty of every government (as, indeed, it has been up to now) and remote sensing is undoubtably the way to improve the quality and granularity of water data for use by national governments, geographical regions, and international organizations. d other aspects of monitoring of water and aquifers: training and standardization of these methods is required. There are problems with current published statistics including quality, granularity, comparison/standardization of types. It is remarkable that no mention of different crops and plant breeding opportunities except as “Seed multiplication/drought resistant seeds” and “Crop genetic improvement programme/Animal genetic resources/ Genetic improvements can lead to crops that required less water or are more drought resistant” as a vague reference in a table at the very end (p. 101). Such research is critical to the sustainable intensification of agriculture, and the increase of appropriate, rain-fed or ground-water based, agricultural production systems to feed people without overuse of water resources. Plant breeders and research scientists recognize not only that there are huge differences between difference crop species in water use and water quality requirements, but there is also extensive genetic variation within existing crop species and their wild relatives. With more research, the genetics can be discovered and applied to ensuring productive agriculture while using less water. There is also need to consider nutritional aims in the breeding context – of both the plants (beyond water requirements), with respect to nitrogen and other nutrients; and importantly with respect to the nutritional value of the crops, the major impactor on human health. The genetic needs should be in the context of existing programmes but not exclude potential significant contributors: CGIAR Centres, the Joint IAEA/FAO Genetics and Plant Breeding programme, national agricultural research centers (NARs), Universities and the private sector. The use of water for efficient agriculture starts with the farmer, and it is critical that farmers are given access to up-to-date research and demonstrations of best-practices in water-efficient agriculture. They are the people – female and male – who will make the difference to agricultural water usage and ensure food sustainability. Broader education occurs through early-adopters with demonstration technology, University and NAR outreach centres staffed with people trained to undergraduate or Masters-level. In much of South India for example, the benefits of large numbers of such people are clear in the disease-control and agronomy practices which are now universal. Involvement of communities at all levels, from use of questionnaires through to community partnerships or cooperatives, can deliver sustainable water usage. Beyond the farmer-level, University research with appropriately trained biologists, agronomists, and geographers is critical to understand the role of water in the environment and food security. Political interference has no part in this science-based training, and there have been problems in implementing and establishing fundamental aspects of agricultural developments. The implementation requires high level governmental support with appropriate funding; international collaborations as the way to develop the new technologies required now and in the next 100 years. Unfortunately, I feel that the current Draft report is too vague and does not address key issues in a way that has an implementation pathway. No doubt that major interventions are required to increase the sustainability of use of the world’s water, with efficient usage and increased production from agriculture. This can be achieved by measuring water usage, improving the genetics of crops, and teaching people. The policy questions need to be well defined, and lead to high quality and robust scientific advice feeding into those policy questions. 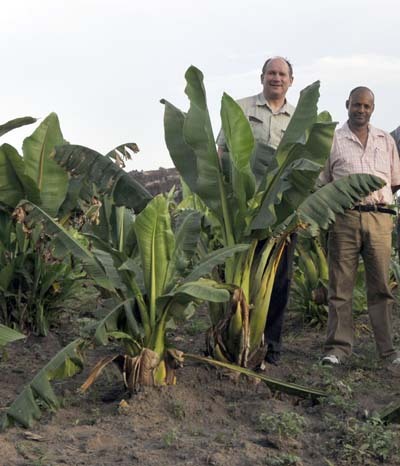 This entry was posted in Environment, Farming, Farming, Literature, News, Research and tagged banana, brassica, breeding, drought, education, ensete, FAO, food, food security, genetics, genomics, iaea, irrigation, research, water, wheat. Bookmark the permalink. The comments given by Prof Pat Heslop-Harrison are very critical and needs to address in coming years to combat water stress conditions. The genetic research and its conclusions would be transformed in local languages to address the farmers needs rather than to burry in high impacted Journals. 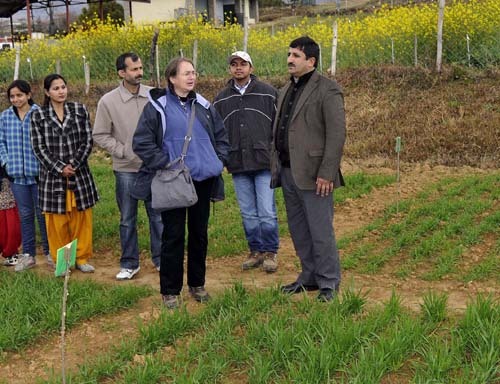 The primary, secondary, graduate and post graduate level students may be involved to deliver lectures/workshops through their respective schools/institution and even religious institutions to ensure fresh and ground water saving techniques so that each drop of water may be transformed in a spike of cereals. The world population is going to touch 9 billions while we are still in zero drafts. The time for concrete action is required if we want world food security. Pat is a visionary scientist and reported truth about the water scenario on the blue planet. Yes, there is urgent need to focus on this issue at all levels. Being agricultural scientist, we have to concentrate on the policy of More Crop Per Drop because Saving of water is securing of food.